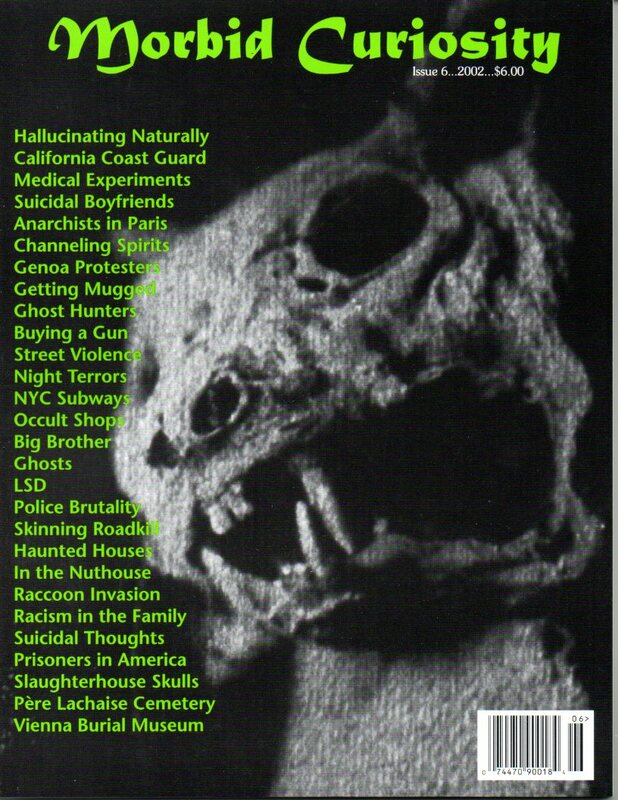 My favorite essay in Morbid Curiosity #6 doesn’t appear in print anywhere else. Shira B.’s “Talking to Strangers” starts slowly, when a man joins her table at the Borders Cafe near her university. Next thing she knows, he’s showing her photos of babies sitting amidst pig’s blood in Bolivia and regaling her with stories that will give her nightmares. And yet, being the person she is, the author can’t back down or walk away or give any other sign how much this guy is disturbing her. It’s a powerful metaphor about machisma, the negative side of curiosity, and the central immortality of youth. One of the other stories that hasn’t been reprinted anywhere else is “Uninvited Guests” by Dean Estes. Dean was regular contributor to Morbid Curiosity, so when I assembled Morbid Curiosity Cures the Blues, it was a job to limit myself to one of his essays. I chose his piece about being baptized in the names of the dead, but it could have easily been his story about driving through Texas with his boyfriend or “Uninvited Guests.” Maybe someday he’ll put together a collection of his own work and sell it on Amazon. It will be amazing. Anyway, daydreams aside, “Uninvited Guests” is about the night terrors Dean suffered when he was a child. They are specifically described, realistic and intense. It was fun to watch him read the piece at Borderlands Books at the release reading for issue #6, because you could see all the audience members hunching forward in their seats, protecting their necks with their shoulders, remembering what it’s like to be young and terrified and knowing that Mom can’t help you — to say nothing of actually believing you. If you’d like, you can check out these stories and more by snagging yourself a copy of Morbid Curiosity #6 here. This entry was posted in Books for sale, Editing, horror writers and tagged Dean Estes, Morbid Curiosity magazine, nightmares, personal essays, Shira B.. Bookmark the permalink.